Carpets hang on walls as a symbol of wealth, lay on floors to create coziness and are presented as expensive gifts. Studying fancy pictures in the shapes of diamonds and stars on them attempting to figure out their meaning is a fairly amusing thing to do. Globally spread carpeting traditions were borrowed from eastern peoples who were the first to learn how to make yarn and fabric out of fibrous materials. Specimens preserved in museums and private collections as well as researches of historians and archeologists testify to the existence of this craft in ages thousands years ago. Steppe nomads of Central Asia started producing and using carpets as an essential part of interior design and additionally as a means of warming habitation. Thank to strong wind-proof fabric these attributes helped preserving heat inside nomad tents at the same time ensuring aesthetic view from the outside. Weaver-craftswomen used to create entire pictures on napped front surfaces depicting household and traditions of those times: caravans of camels carrying utensils, wedding ceremonies and images of tribes resting by the fire. By the way, such masterpieces were weaved intuitively, without neither drafts nor sketches. Therefore it was impossible to come across two identical “carpet units”. The oldest napped long-liver was discovered during diggings in one of grave-mounds in high-altitude Altai. Approximate date of its production, specified by the scientists, is 5th century B.C. But despite conditions of preservation (2500 years in ice) the item turned out to be almost undamaged. Now the only carpet, that you won’t be mocked at after having a photo against, is displayed in Hermitage. Women who had learned the trade of carpet weaving were acquiring the status of the most respected people of their tribes. Taking for a wife a weaver was nearly more prestigious then a chieftain’s daughter. Leaders of communities themselves treated handywomen with as much respect as ordinary people did. Special nomad tents were built for them, far more spacious and cozy, so that they could have comfortable rest in their time off. Alongside personal dwelling, needlewomen were allocated their own camels in the amount far larger then anybody else had. They performed a role of production equipment “transporters”. There was another special tradition to dress pack animals carrying property. Special pentangular twin carpets used to be made for the purpose, moreover every owner was obliged to have a gala outfit for the pet for festive occasions, but there was no way to buy it in those times just as any other napped items: they weren’t subject to purchase and sale back in the time. People had to queue to craftswomen in order to get a desired unit or exchange it for something from fellow tribesman. With transition to sedentary life everything changed yet importance of carpets in household of eastern people still remained significant while one of the most honorable crafts became also very profitable. New ornamental traditions began their formation in those times, knowing the interpretation a carpet could have been read like a book. Vegetation patterns resembling trees or flower bouquets were considered a symbol of nature and eternal life worshiping. Items with images of the kind often served as dowry for brides and were given as presents for weddings and birth of children. Geometrical motives consisting from various lines, dots, dashes, rectangles and other figures bore magical meaning. Depending on symbols and their combinations, such carpets performed functions of dwelling talismans. Special units were even picked for every room with one or the other element prevailing. For instance, items with numerous triangles were customary hung or laid in a living room: it was believed that they scared away people with evil intents. Another traditional eastern pattern is a star symbolizing luck and wisdom. Such carpets were often given as gifts to representatives of other regions. 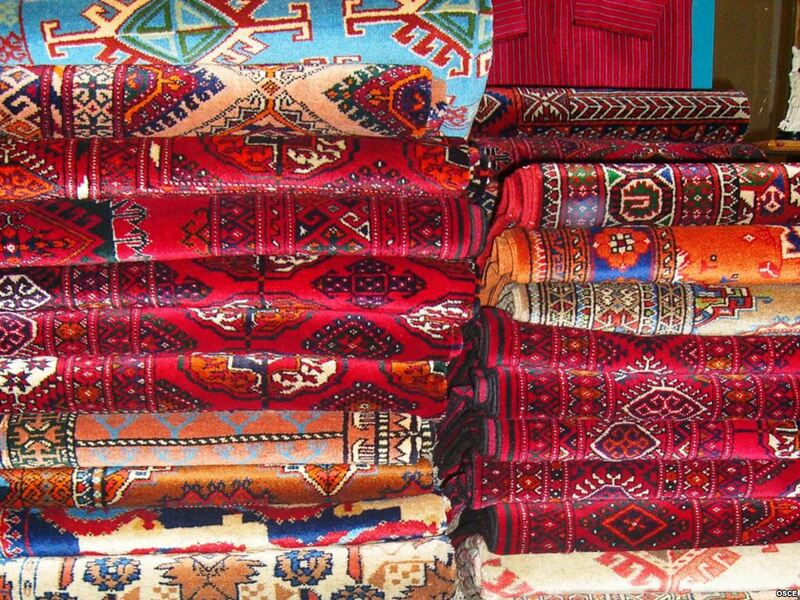 In a number of Middle East countries carpet weaving still represent the most important field of population’s occupation. And although production became automatized to a certain extent, people keep memory of the craft’s origins and old hand-made traditions.Azerbijan, Iran, Kyrgyzstan, Turkmenistan and Turkey supply the world with the best handmade napped items. In some states national holidays dedicated to the art of carpeting exist; record-setting large units are made, able to cover not just a room but as much as a square… Insight into a history of this craft isn’t over yet. OUTLOOK will tell about its significance for cultures of different countries in coming features. Languages. Which one is the next to disappear? Very soon we will lose their melody, then we won't recognize the words and finally the meaning will become a mystery to us. Disappearing languages. How many of them were there over the entire period of the existence of humankind? No one know that, and as February 21 marks the International Mother Language Day, we have prepared a post about endangered languages to pay attention to this issue once again.